Worlds of Difference is a six-hour limited series that uses sound-rich features to explore the impact of global change on local cultures worldwide. Worlds of Difference looks at how local cultures around the world are responding to the pressures of global change. Six hour-long programs combine sound-rich features with narration, music, collected sound, and the comments of leading thinkers. Stories come from 23 different countries. The programs are hosted by María Hinojosa and distributed to public radio stations by NPR. Each of the specials addresses a theme: the relationship between cultural identity and the market; identity and language; identity and place; identity and religion; identity and the past; and identity and the path to the future. Each hour can stand alone, and there is no necessary order. PRODUCERS: Producers include Sandy Tolan, Alan Weisman, Jon Miller, Chris Brookes, Dmae Roberts, Frank Browning, Marianne McCune, Vera Frankl, Julian Crandall Hollick and Karen Michel. BROADCAST HISTORY: Most of the individual features aired in slightly different form on NPR newsmagazines or on NPR's Living on Earth between June 2003 and October 2005. CLOCK: "Finding a Niche" follows the Public Radio Collaboration clock (billboard 0-1, news hole at 1-6 min, 1-min breaks at 21 and 41:30). The other five hours follow the NPR specials clock (billboard 0-1, news hole 1-6, 30-sec break at 6, 1-min breaks at 19 and 39). PROMOTIONAL MATERIALS: Audio promos (30-sec) are posted for each hour, and one is available for the series as a whole in the attached files section of this page. Photos are also available. Contact Jon Miller at jon@homelands.org for more information, logos, etc. WEBSITE: Stations are encouraged to link to the project website (http://homelands.org/worlds), where listeners can find photos, audio, articles, a complete story list, profiles of contributors and links to additional resources. LICENSING: The programs are free to all NPR member stations through September 26, 2006. Non-member stations please contact Joyce MacDonald at jmacdonald@npr.org. A Roma couple who married as teenagers campaign against child marriage. An enormous grassroots network in Sri Lanka seeks to provide an alternative to conventional economic development. 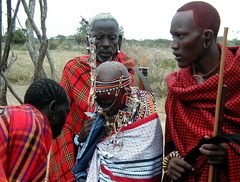 After generations of resistance, the Maasai of Kenya are looking to education as a way to keep their culture from dying. A drug-treatment program on Oahu's depressed west coast uses traditional teachings to combat methamphetamine addiction among native Hawaiians. Native artists in the Ecuadorean Andes return to their people's sacred mountain. A well-known Turkish novelist confronts her country's modern history on a nondescript street in Istanbul. With just four surviving native speakers, a tiny tribe of Amazonian Indians tries to revive its dying culture. Jon Miller visits a nationalistic rock band comprised of Orthodox monks in Greece. Jon Miller reports on a resurgence of interest among Greeks in their pre-Christian roots. Producer Frank Browning visits an Irish town where economic prosperity has locals wondering how to move forward while keeping their traditions intact. Chiloe: A Bridge Too Far? Sound-rich feature about a Mexican village's efforts to keep its menfolk from leaving for the United States by marketing its hand-made liquor. Sandy Tolan visits with some of Bulgaria's last Ladino speakers as they try to keep their language from going silent.